Building a waterpark near a historic site has undoubtedly happened in the past – perhaps numerous times. But building a waterpark within mere yards of an 800-year-old church tower and spire is undoubtedly a once-in-several-lifetimes event. The challenges of situating the new Coventry City Centre Leisure Park in Coventry, West Midlands, Central England, then, was one that required unusual respect and specialized considerations, and Polin Waterparks is honored to have been chosen as the waterslide supplier to this unique project. FaulknerBrowns Architects fulfilled the requirements of the historic £36.7 million (US$41.26 million) undertaking. The firm has designed many innovative and award-winning buildings, including Derby Arena, a velodrome for the Pan Am games in Toronto, the canoeing and sailing centers for London’s Olympics in 2012 and an Olympic-standard aquatics center in Dubai. Other key contributors to the project include the main supplier and construction firm the Buckingham Group Contracting Ltd. (Stowe, Bucks, U.K.) and consultant Neuman Aqua Ltd (Ockley, Surrey, U.K.). Dramatic night lighting will emphasize the modern shape and provide a view inside via huge frameless windows. To accommodate all of the necessary elements that city leaders are requiring of their new council -owned facility, however, its designers have gotten even more creative. Specifically, the new facility promises to provide not only waterpark elements but also a 25-meter swimming pool, a gym, a climbing wall, squash courts, a dance studio, a day spa and administrative area. Providing such a wide range of amenities within a limited space meant going up – as in three stories up, stacking the building’s offerings into a multi-level structure. Accommodating six slides into such a tight space required extraordinarily delicate design skills. For example, the bowl of one ride – Polin’s Space Hole – sits smack in the middle of the building and exits riders into a plunge pool on the floor below. The other slides also exit on the second floor, and a spiral ramp helps guests navigate back to the third level. Polin Waterparks needed to incorporate the building’s unique considerations into its slide designs. This meant specially designing several of the waterslides, such as creating a Mini Tsunami and a Navigatour with three uphill sections – one with and two without waterjets. It also meant designing all of the slides except for the Space Hole to incorporate dry-out exits without pools. And it meant restricting the heights of all of the slides. At this facility, then, the Space Hole is 14.62 meters (48 feet) high, and the other five slides are 11.50 meters (37.72 feet) high. Tunnel Bodyslide (family slide) with Slide’n Roll special effects. This specially engineered ride delivers a long, smooth journey that combines all of Polin’s most exclusive technologies – unique sound, lighting and design special effects – into one slide that creates an experience that fulfills the full range of sensory stimuli for guests. Sphere-Space Shuttle Combo. Polin fused two of its rides to create this streamlined attraction that puts two riders on a raft that enters a steep drop that sends them speeding into both a sphere and a pod. In both, gushing water propels riders from side to side before exiting out and expelling them downhill. Natural Light Effects (NLE) technology makes this ride come alive with color as light from outside the tubes interacts with water sluicing inside to create amazing light effects. The Space Hole. Situated at the centre of the new leisure facility, this ride propels riders through an enclosed tube that exits into a huge, open bowl. Centrifugal force whirls riders around the bowl’s interior before they exit via a breathtaking splash through the bowl’s center and drop into a plunge pool on the second floor. NLE technology adds extra drama to the ride. Mini Tsunami. High-capacity is the feature of this waterslide that is strategically designed for “end-to-end” excitement. 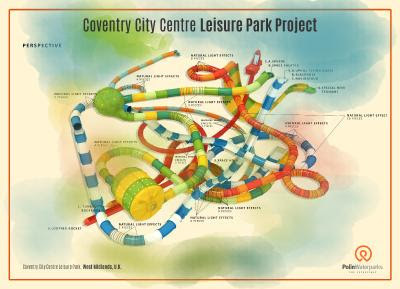 The slide will feature a custom Coventry logo design on its exterior. A Navigatour. Riders slide along a breathtaking 135-meter (443-feet) path on this ride. Whether riding singly or with a friend, travelers slip in and out of the light as they experience an amazing light show due to the slide’s NLE technology. Looping Rocket. This attraction features a unique “launch capsule” with a trap door that opens to send riders through a high-speed, horizontal, 360-degree loop. Translucent components allow other guests in the facility to watch riders shoot through the slide’s tubes. All of Polin’s slides at the project are manufactured using Light Resin Transfer Molding (L-RTM) technology. Polin pioneered this technique for waterslide attractions – a process that creates multiple advantages. Significantly, the technique creates slide components with a shiny, smooth finish on both the interior and exterior. The technique also allows for stronger yet lighter waterslides that are easier to install – a particularly important feature in facilities such as Coventry City Center where weight is an obvious factor. A third advantage of the L-RTM technology is that the outer surface of each tube is particularly bright and smooth, reducing dirt’s ability to adhere to the tubes and making them easier to clean.